Ana was one of the rockstars of the 2017 Teacher Institute, an immersive professional development experience at Stone Barns Center. Teachers spend two weeks on the farm and in the kitchen training in our high school food studies curriculum to bring back to their students. The curriculum’s interactive lessons explore food’s relationship to culture, the environment and social justice. Teachers leave with a toolkit for guiding their students to become food citizens – individuals who understand that their food choices have a meaningful impact on personal, environmental and community health. By training teachers in a farm-focused educational experience, we hope to shift their students’ thinking about the role they play in bringing about a better food system for us all. From an early age, Ana was an innovator. She remembers experimenting with making a cold rice salad for her family when she was 10. Rice was always around in her family, but cold rice? Never. The precocious chef insisted that her family try it, and everyone loved it. Ana was forever hooked on feeding and hosting others, and she hasn’t looked back. 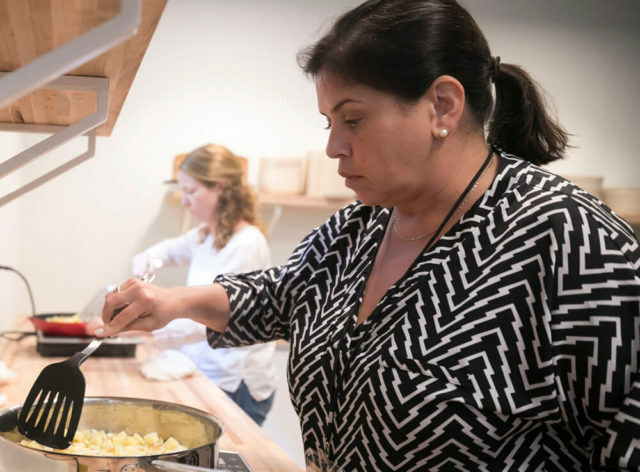 Ana spent 20 years in catering, then moved into teaching culinary arts at MAST Academy near Miami. Sustainability and the role of food in community was always woven into her lessons, so when she received an email from a colleague about the Teacher Institute, she knew it would be a great fit. She had already begun to formalize the cultural components of food and nutrition into her classroom through partnerships with a local farm and fishery, but the Stone Barns food studies curriculum would provide lesson plans and a framework to bring these themes front and center for her students. A few memories from her time at Stone Barns stand out in particular. She loved interacting with the farmers, especially the young farmers, who work at Stone Barns and seeing the labor of love that goes into producing a truly sustainable, regenerative farming enterprise. While she was here over the summer, the turkey chicks arrived – and realizing that four months later these little poults foraging in the woodlands would be Thanksgiving dinner for members of the Stone Barns Community made all of the farm principles come alive for her. Harvesting produce from the farm and learning different ways to process them that relied on a whole-farm approach – like carrot-top pesto (see recipe here) – gave her concrete ideas that she could bring back to her students. Now back in Florida, Ana incorporates lessons from the food studies curriculum into her Culinary Arts courses for high schoolers. She’s seen the lessons inspire and outrage her students by causing them to question long-held assumptions about the food system and enabling them to peek behind the curtain of industrial agriculture. Her students wrestle with the implications of this knowledge in their own lives, looking at how to minimize food waste at home or even taking the drastic step of giving up their favorite breakfast cereal after learning it contained genetically modified ingredients.